When Josh, Naomi, and Ben first started imagining something new at 43 East College Street, they didn't envision a $15-million real estate development. Their first idea was to convert the building into a community center for social service programs and a youth center, with employee housing added in the back. They took this idea to Daniel Gardner '89, then the director of the Oberlin Partnership program and now chair of the Oberlin City Council. He wasn't keen on the idea of a youth and community center, thinking there was already enough of that kind of space in town. Besides, he'd seen many eager young grads burst into his office with big ideas about undertaking a noble project in the community but fail to follow through. So he offered Josh, Naomi, and Ben some advice. Go talk to the city manager, people at the College, and others in the community, he told them. If they neglected to do that, he'd know they weren't serious. "But they followed up on everything," Gardner says. "They did everything I asked, then just kept showing up in my office. Even when I had my door closed to work on something else, they would wait outside, ready to pounce." Artist's rendering of the mixed-use development at the corner of East College and South Pleasant streets (looking southwest). By talking to Gardner and the others he suggested, the trio began to focus on Oberlin's real needs: affordable housing and a more robust retail climate. They already knew that good, affordable housing in town is rare, and that many people who work at the College can't afford to live in the city. They began to bone up on the particulars of Oberlin's economic activity. A study done several years ago showed that Oberlin's downtown is struggling: one-third of the businesses were suffering flat or declining sales, even as commercial rental rates remained high, and a quarter were in danger of closing. With Wal-Mart and big-box retailing poised at the edge of the city, pressure on downtown business would only increase. And the College—the city's biggest employer—certainly isn't immune to the troubles right outside its doors. "If the town doesn't have strong schools and a healthy downtown, you won't have professors who want to live here," says Clyde Owan '79, past president of the Oberlin Alumni Association. "When professors live in town, they host students at their homes. It's a great way to get to know your prof as a person, not just a pedagogue—it humanizes the faculty and is good for the whole community. If the town is not thriving, socioeconomic tensions are exacerbated and the College becomes an isolated fortress. That's not good for anyone." SCA's vision began to shift as the three partners studied the sobering trends. "You can look at the town's social problems and decide that what's needed is another program to address them," Ben says. "But maybe what people need are jobs. Maybe we need to bring more businesses to town. Or maybe people need an apartment that doesn't have $300 monthly gas bills in the winter because the building is 150 years old and the absentee landlord doesn't put any money into it. And just maybe there's a way to address all of these needs at one time." 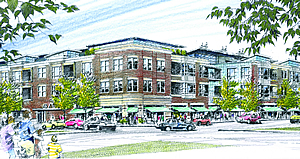 Providing Oberlin with quality affordable housing and rekindling downtown retail activity? A bit more daunting than a community center. But the challenge didn't deter the three partners, at least not for long. "Why not attempt something big when you're 22?" Naomi asks. "One of the things we had going for us was that none of us had much to lose. We didn't have jobs, we didn't have children, we didn't have a payroll to meet. We weren't very risk averse. The fact that our time was worthless was really valuable, because we had to do so much research and talk to so many people and put so much time into understanding things. It turned out that being right out of college was a great time to do something like this."